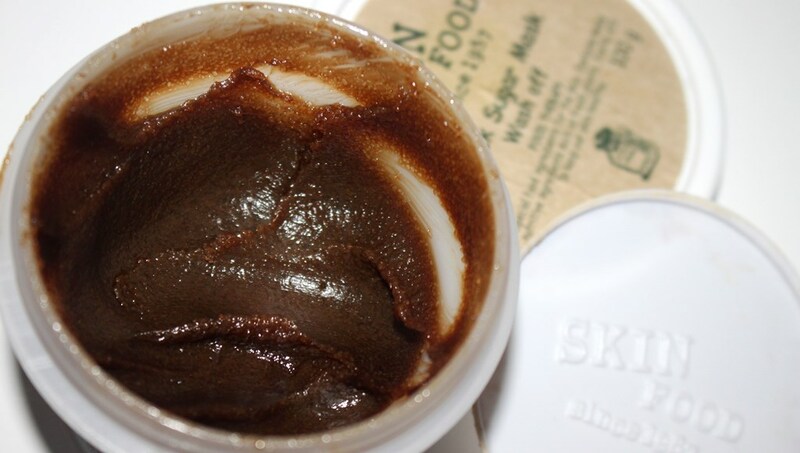 The Skin Food Black Sugar Mask claims to contain mineral-enriched Brazilian black sugar for excellent keratin improvement, promoting smooth, glowing skin. Not surprisingly, the highest concentration of the mask formulation comprises Sucrose, a natural sugar. Sucrose effectively and naturally delivers both a physcial and chemical exfoliation to the skin. A glycolic acid source (alpha hydroxy acid), it penetrates the skin to encourage cell turnover whilst it’s grainy physical texture also makes it an excellent topical exfoliant, both assisting to achieve a fresher, younger looking complexion. As a humectant, sucrose attracts and retains moisture helping to keep skin hydrated, complementing the abrasive nature of the resurfacing process. Candelilla wax is rich in nutrients and acts as a barrier to help prevent moisture loss. It also acts as an emulsifier, binding ingredients together to create a workable texture. Macadamia Ternifolia Seed Oil is readily absorbed assisting to firm the skin and promote a youthful glow. Macadamia oil restores the skin’s depleting levels of palmitoleic acid (due to ageing) and helps keeps it taut, discouraging wrinkle formation. Meadowfoam Seed Oil is easily absorbed and helps control the skin’s oil balance. As such it is a great acne treatment. This oil is often used as an ingredient in body scrubs to promote a natural glow. It also fights wrinkles and fine lines with natural antioxidants that lock in moisture and helps rid the skin of unwanted free radicals. Lanolin is extracted from sheep’s wool. It exhibits strong moisturising properties, able to deeply penetrate the skin thus making it useful for treating cracked, extremely dry or itchy skin. Lanolin creates a barrier on the skin to prevent moisture from escaping, helping to keep it supple. Several ingredients are added for their smoothing, hydrating and moisturing effects, among them at fairly high concentrations are PEG-7 Glyceryl Cocoate and Glycerin as well as Caprylic/capric triglyceride, Cetyl Ethylhexanoate and Butyrospermum Parkii (Shea Butter) to a lesser extent. 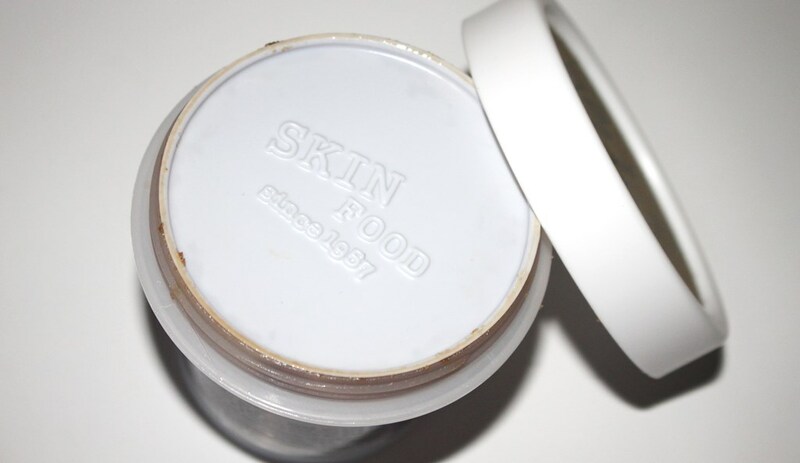 The Skin Food Black Sugar Mask comes in a plastic screw top tub with a protective inner cap. The inclusion of fragrance and parabens for scent and preservative function respectively, effect the rating of both the CosDNA and EWG reports, ultimately causing the return of a moderate hazard classification. After cleansing, massage onto damp face avoiding the eyes and mouth. To minimize irritation, add water or toner while massaging. Leave for 10-15 minutes then rinse off with lukewarm water. 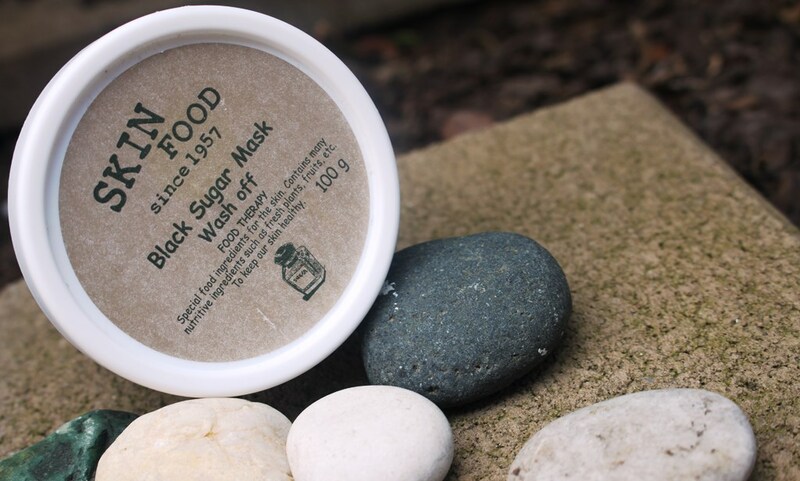 This Skin Food Black Sugar Mask has a sweet scent and at the same time displays a citrus smell. 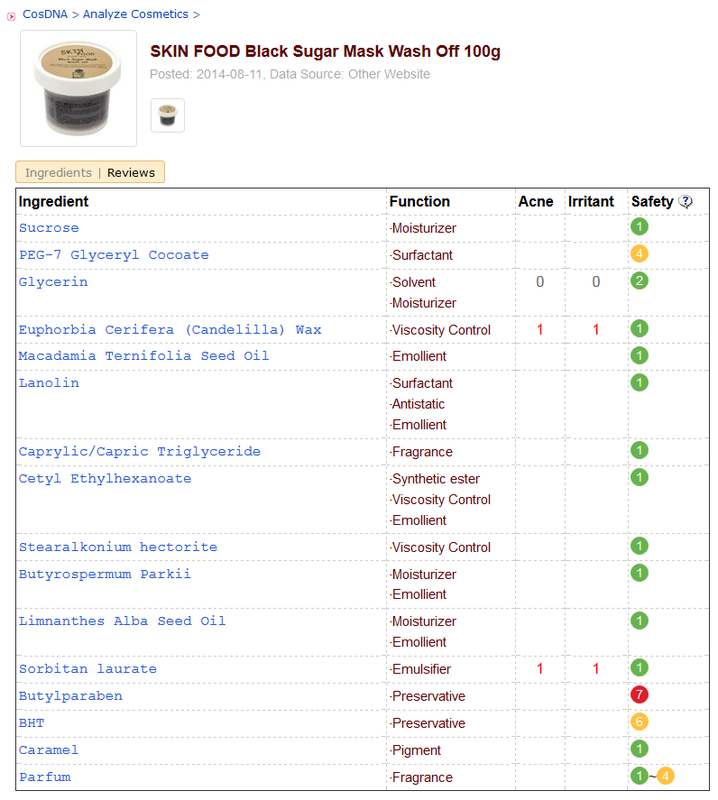 The 100g jar of the Skin Food Black Sugar Mask retails at approximately AUD$13.00. The Skin Food brand is widely available online at many skincare boutiques including SokoGlam, Yes Style, iHerb and Style Korean. The face mask must be used within 12 months of opening and from my understanding of the packaging which is primarily in Korean, has a shelf life of 28 months. A marketing ploy of the Skin Food brand is the promotion of food like packaging. They produce several scrubs, all similarly packaged to look not unlike a conserve or chutney. The cute jar features a kraft paper label, keeping it looking humble and homey. Unfortunately, there is no spatula with which to apply the scrub but I would prefer to sacrifice luxurious presentation for an inexpensive product. 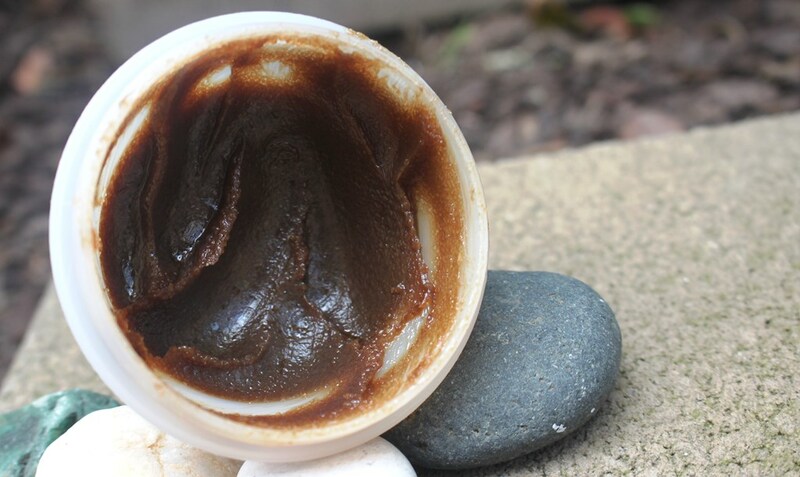 Besides, there are always spatulas lying around from other creams, masks and scrubs that can be reused. Application involves scooping some of the product out and placing it on damp skin, best done straight after cleansing while still moist. The mask is very grainy and the exfoliation effect obvious when you start to circle it onto your face. This should be done in a gentle manner without harsh scrubbing for around two minutes. Any less, and the effects are not fully realised whilst any more and you may disrupt the skin barrier by over-exfoliating. Once complete, the scrub should stay on the face for around 10-15 minutes and then rinsed off with lukewarm water. Immediately after cleansing, skin feels baby smooth and looks super bright. The exfoliation is very effective and the benefits immediately experienced. The formula incorporates several moisturising and hydrating ingredients and even anti-ageing meadowfoam seed oil. Although they may contribute softening and hydrating effects, potentially some of the ingredients are not on the skin long enough to have a lasting impact. There is sufficient support however to ensure skin does not feel tight or dry afterwards. Scrubs should generally be avoided when skin is irritated or subject to an acne breakout as their abrasive nature can further damage compromised skin. Also, acid products should not be applied in the same routine as they deliver a chemical exfoliation. The double effect can lead to irritation and will strip the skin barrier, cause stinging or more significant damage. Finally, scrubs should be applied no more than around two times a week. Butylparaben is a synthetic preservative that lengthens the shelf life of cosmetics. Some research suggests that parabens can mimic hormones in the body and disrupt functions of the endocrine system leading to cancers. However, FDA scientists continue to review published studies on their safety and there is currently insufficient information to show ill effect on human health. 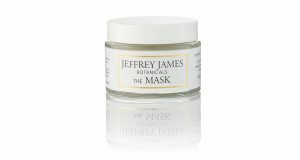 This mask is so effective and so reasonably priced, it is no wonder it has such a loyal and widespread following. Although it does include synthetic preservatives, caramel colouring and artificial fragrance, it’s so good that you can almost turn a blind eye to these indiscrepancies! Having said that, if you suffer sensitivities or irritations, tread lightly, if you don’t, your skin will appreciate it. Once you try this mask, you simply won’t be able to stop touching your face. This is my favourite sugar mask and although I love to trial difference brands, I will always go back to this one by Skin Food.